A frustrated housewife sets out to see more bird species than anyone in history—and ends up risking her life again and again in the wildest places on earth. Phoebe Snetsinger had planned to be a scientist, but, like most women who got married in the 1950s, she ended up keeping house, with four kids and a home in the suburbs by her mid-thirties. Numb and isolated, she turned to bird-watching, but she soon tired of the birds near home and yearned to travel the world. Then her life took a crushing turn: At forty-nine, she was diagnosed with cancer and told that she had less than a year to live. Devastated, she began crisscrossing the globe, finding rare and spectacular birds that brought her to the heights of spiritual ecstasy. But as it turned out, she beat the cancer. She eventually went to more than a hundred countries, had frequent brushes with danger, became a hero in the birding world, and set a record for the most species seen. 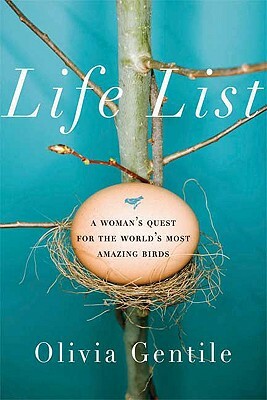 Life List is a powerful portrait of a woman who found refuge from society’s expectations in a dangerous and soul-stirring obsession. Olivia Gentile earned a B.A. from Harvard College and an M.F.A. from Columbia University. She was a fellow at the MacDowell Colony in 2006. She was an award-winning newspaper reporter in Vermont and Connecticut and now lives in New York City.